A NEW £1.5million fleet of buses on the Isle of Arran has driven tourism bosses round the bend. The eco-friendly arrivals have been branded a waste of cash – because they have no space for visitors’ luggage. The buses boast hybrid engines and were meant to make the island fully accessible for the first time. But the vehicles, introduced over the past few weeks, have been slated by tourism chiefs as unfit for purpose and unsuitable for the holiday isle. Islanders say the vehicles have struggled to negotiate hilly terrain when full of passengers. Mechanics have already been forced to make changes to the fleet’s gearboxes in a bid to solve the problem. 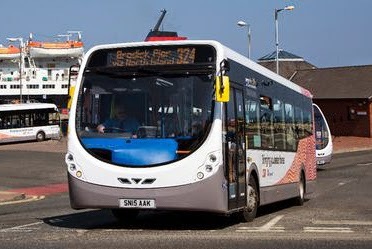 Strathclyde Partnership for Transport bought a dozen new buses to upgrade services on the island. The fleet is comprised of eight Wrightbus Streetlites, which use hybrid technology, and four smaller Optare Solos. One islander said: “They’re the talk of the place. There’s no space for bags or suitcases – which is not much use on a holiday hotspot. “They have these new engines which are designed to save the environment but the impression is they are a bit under-powered when the buses are busy. SPT, who have leased the buses to Stagecoach Western, admitted gearboxes were “re-programmed” to take account of the island’s hilly terrain. Visit Arran executive director Sheila Gilmore said: “We welcome the investment by SPT and these are beautiful shiny new buses but they aren’t fit for purpose. “There’s nowhere to put luggage. They are urban buses – they’re not designed for a Scottish tourist island. “Arran’s just been ranked No1 Scottish island on TripAdvisor. That highlights how important visitors are for us. “We’re extremely disappointed that thought wasn’t given to the carriage for luggage or space for bikes on these buses. We’re trying to encourage people to use public transport on Arran but it’s very difficult to tell people to bring their golf clubs if there is nowhere to put them on the bus. There aren’t even any overhead luggage racks. All the people coming off the bus who are staying north of Brodick are probably carrying luggage. Sheila said the tourist group had been in touch with SPT about the matter. An SPT spokeswoman said: “We’ve received very positive feedback from Stagecoach regarding the vehicles SPT funded for use on Arran. “These vehicles have conventional diesel engines along with additional equipment fitted to reduce fuel consumption and exhaust emissions in order to improve air quality and be certified as low-carbon vehicles. “Following some feedback from the drivers, we understand the gearboxes were reprogrammed to take account of the terrain on Arran but we are not aware of any impact on passengers. A Stagecoach spokeswoman said: “We’ve received very positive feedback about the new fleet of vehicles from passengers, which are providing accessibility to more people to travel around Arran.